The jeweled piece begins with a large glass crackle round in beautiful chartreuse. 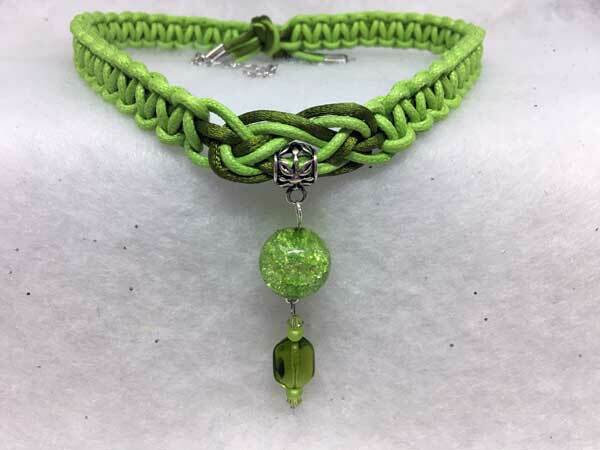 Hanging separately from this, for extra movement and sparkle, is a twisted glass hexagon in olive green, surrounded by green seeds a tiny green bicone crystals. Lots of sparkle in this one! The piece is finished in a lobster claw clasp and an added 3 inches of chain for flexibility in the length.